That sounds like a good day to me, you? We slept in, ha ha. Ok, slept in is exaggerating, but stayed in bed, that’s more like it. Unfortunately, I don’t know how to sleep in, but it was definitely comfy! I was sleeping on a double height queen sized blow up mattress, super firm and comfortable, window open and I could hear the traffic go by, made me feel like I was at home in my bed at my dad’s house, slept well! We got up eventually, went to brunch at a local diner in the neighborhood, yummy. Then headed back to downtown Chicago, walked around, window shopped, went to our favorite nail place for some massages chairs and attention to our claws and paws. The fun part, we weren’t there right before closing, we could take our time and not worry it was just before closing. After our spa treatment, we needed some munchies, I was craving guacamole, so off to The Taco Joint for just that and some other treats, yum! Later that night, a treat! The architectural fireworks boat tour! This was my fifth boat tour of Chicago, which I love, DLP hadn’t done one yet, touristy check! You know, when you live in a city, you don’t always do the touristy things! Even better, LJ and her beau, JD, joined us. It was a great tour and out guide is one that I’d had on another tour, he was a lot of fun. 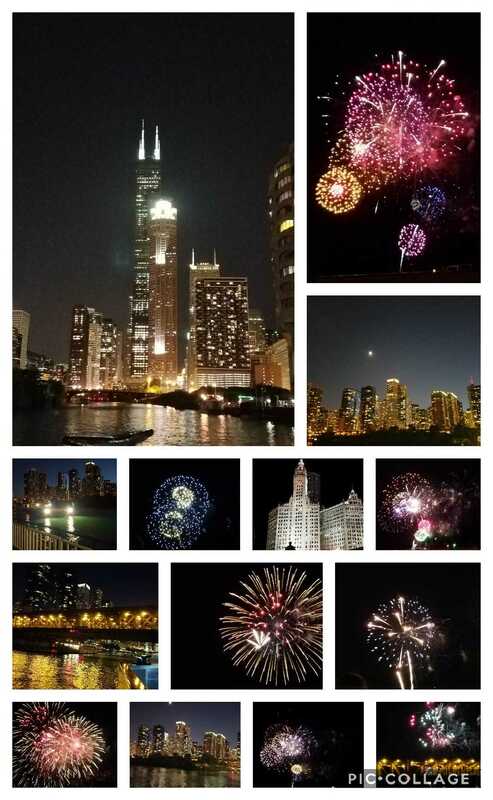 Everyone enjoyed it and the fireworks at Navy Pier were a lot of fun! After, we went to see their new apartment, great view, location and feel, perfect for them. Next, food! We were hungry! It was a great night with great friends!